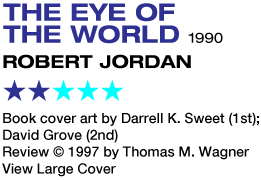 I know that I am about to endure much wrath from Robert Jordan's legion of fans for this review. 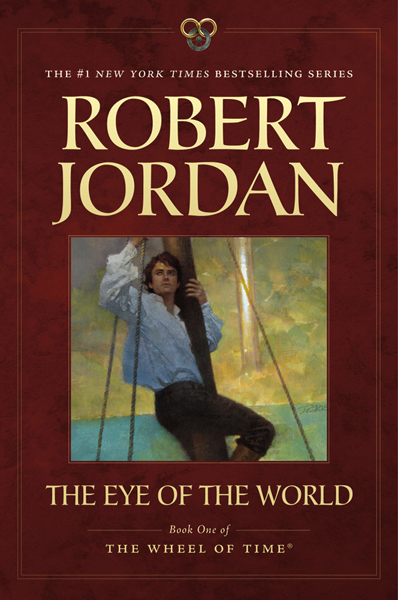 After all, The Wheel of Time (initially proposed as a ten-book epic, but which has stretched to 14 following Jordan's untimely death in 2007) has become the bestselling fantasy phenomenon, overtaking Terry Brooks and Piers Anthony, with each new volume firmly ensconced in the New York Times Top Ten. Well, fine. I congratulate Jordan on his success. 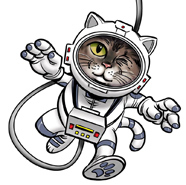 It's difficult to write fiction and get it published. It's even harder to make a living as a full-time writer, much less get really really rich at it. Nevertheless, one crucial question remains: are the books any good? Jordan fans will proclaim "YES!" and that is as it should be. We're all of us entitled to our own opinions, and I'm happy that the multitudes who follow this series have discovered stories to warm their hearts and keep them breathless for the next one, even though I might feel they'd be even more satisfied were they to direct this attention towards Guy Gavriel Kay or Philip Pullman. From what little I have read to date of The Wheel of Time, I am, so far, a dissenter. Though I acknowledge that Jordan's prodigious flow of words has produced much that is admirable, this saga cannot avoid specific criticisms: mainly, that each volume is criminally overlong, and that this debut volume, despite several clever and interesting touches, is nothing more or less than the purest formula fantasy, predictable at almost every turn and woefully lacking in the dramatic tension and conflict necessary to hold a reader through hundreds of thousands of words of plot. Jordan's vast, Eastern-religion-inspired backstory conceives of time and history as an enormous wheel. All events happen again and again, with such a huge time lag between epochs that history has conveniently forgotten the previous era's events by the time they come around again. The Wheel of Time is driven by the True Source, the "driving force of the universe," which has a male half (saidin) and a female half (saidar). Only men can draw magical energy from saidin, only women from saidar. However, at the beginning of Time, there was, natch, a big slugfest between the Creator and the Dark One, which resulted in the Dark One's imprisonment. When said Dark One's minions tried to free him, and the good guys tried to corral him yet again, the resulting war caused the Breaking of the World. This tainted the male half of the True Source, saidin, with evil. Therefore, any man who now attempts to access saidin goes irrevocably mad. In the ensuing years, fear that the Dark One will break free yet again has been somewhat tempered by the prophecy of the Dragon Reborn, a heroic figure who will once again imprison this nasty old Dark One for keeps. Unfortunately, there will be another Breaking of the World when he does so. Get all that? Good. In The Eye of the World we meet Rand al'Thor, (all together now) a callow youth from a bucolic farming community. Rand is met by Moraine, a member of the Aes Sedai, a society of female magic-wielders, and her warrior cohort Lan. Moraine is aware that something big is in the air, and that Rand, plagued by nightmare visions of the Dark One beckoning to him (hmmm...), is involved. A journey to Tar Valon, the Aes Sedai stronghold, seems to be what the doctor ordered, as it is imperative to see what power Rand may have, and what role he may play in upcoming events. Hands up if you've figured out that Rand is the Dragon Reborn. Oh, calm down, I'm not spoiling a thing. This in fact the first point every critic of this series makes. The story is so rote, so formulaic, that Jordan telegraphs practically every major plot point dozens and sometimes hundreds of pages in advance. Not so bad if this were an average escapist fantasy novel of 75,000 words or so, readable on a lazy afternoon. But The Eye of the World began a "size matters" trend in epic fantasy publishing by weighing in at 782 colossal pages (not counting the glossary). Later volumes like The Fires of Heaven are so fat that their paperback editions look like little Acme bricks. This led to guys like me putting on our Captain Obvious helmets and formulating Rule #1: just because a book is really, really long does not automatically make it great. Jordan doesn't tiptoe through the Tolkien-tropes with quite the lazy abandon of Brooks. But this is still a story where everybody hops onto horses and takes a long long cross-country ride to their destination...just like Tolkien. At one point they all become split up...just like Tolkien. The whole way they are menaced by Trollocs (Orcs) and Myrddraal (Nazgûl)...just like Tolkien. Now, Jordan fans may argue that Jordan enhances Tolkien by creating realistic and believable characters that readers care passionately about, as if Tolkien didn't. I'd be the last person to deny that since Tolkien more or less invented modern fantasy, the concepts that he pioneered have been expanded upon and greatly improved upon by other writers. Jordan isn't one of those writers. He lacks Tolkien's instincts for restraint, his sense of pacing, his clarity, and yes, his gift for characterization. Few members of Jordan's cast make much of an impression at all. Almost everybody's a stereotype plugged in to a stock role, as if on RPG character sheets. Rand al'Thor is so dull a hero he'd be better called "Bland" al'Thor. Sure, it's laudable to depict his confusion and distrust towards the attentions and responsibilities that are being thrust upon him. But he still just isn't terribly interesting. (And besides, put him together with his chums Mat and Perrin, and you have another clichéd trio of unlikely fantasy heroes á la Frodo, Merry, and Pippin.) People ready to jump on the fact that Jordan gives women quite a lot to do in this series should be reminded that Abbey, Cherryh, McCaffrey, LeGuin, Bradley, Kurtz, Lackey, Tanith Lee and other writers have handily beaten Jordan at this game, too. The extreme length of the book isn't due to storytelling complexity so much as that Jordan's padded it to the ceiling with ephemera. Several sequences that take place during the characters' separation do little and sometimes nothing to further the plot, and serve primarily as a chance for Jordan to take us on a travelogue of his world. In one scene, our heroes make a pit stop and are harassed by baddies in an enormous ruined metropolis that, illogically, no one else has apparently discovered in thousands of years, and the real nature of which will (of course) be left to a later volume to explain. Ultimately the repetition becomes tiresome: characters ride awhile; almost get caught by minions of the Dark One ("darkfriends"); narrowly escape; repeat. I did like the concept of the Aes Sedai, and Jordan's depiction of the bigotry they suffer for being the only active magic-wielders in this culture (people scapegoat them for causing the Breaking of the World). No one will claim Jordan has dashed any of his world-building off. I found the "Ways" most intriguing. And the book ends with a bravura battle scene and final act from Rand that does at least generate some much-needed emotional response from the reader. That Jordan couldn't sustain such power for all its length probably indicates he was still, this early in his career, more assured in his ambitions than in his skills at realizing them. Ultimately, what frustrated me about Eye was not that it was lousy by any stretch of the imagination. It was just that so much work had gone into producing a story so routine, so mundane, so...mediocre. But perhaps that is why The Wheel of Time has become such a gargantuan bestseller. Jordan has simply created a series for fantasy fans who have a comfort zone and don't wish to stray out of it. That may be fine for some people. For me, a wheel is no good unless you can burn a little rubber. The UK paperback, as well as a US version briefly released for the young adult market, is split into two volumes: From the Two Rivers and To the Blight. Followed by The Great Hunt.